Sanotint Migliorin hair care. Gentle hair solutions for ALL hair types - Vivasan Webshop English - World wide delivery Vivasan Official Webshop® is specialized in shipments to the UK, Ireland and Scandinavian countries. Best prices! Sanotint looks after your hair and colours it carefully and gently with Sanotint Classic and Sanotint Sensitive Light. Sanotint products prevents skin problems, preserves it from atmospheric agents, washes and treats it to make your hair more beautiful than ever. Migliorin products take care of tired hair and hair loss with food supplements, shampoo and other special products. Sanotint and Migliorin hair products contain valuable natural components such as extracts of millet, horsetail, nettle, hop, and are aimed at a wide range of consumers. The basic idea of Sanotint and Migliorin is a strong believe in the natural power of nature itself, always avoiding as much as possible chemical substances. contain natural plant components, tested on dermatological tolerance; are free from preservatives and artificial colorants, have natural pH balance (рН5.0-6.0); have no side effects, are recommended to both adults and children. They do not violate the skin and hair hyrdolipid and are suitable for frequent application. Sanotint and Migliorin products don’t contain derivates of animal origin, are dermatologically tested, paraben-free, GMO-free, without preservatives, without added metals, Alcohol-free, and Sanotint Light is free of Para-Phenylenediamine (PPD). PPD is the cause of many allergic reactions. 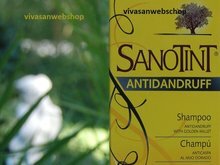 Sanotint shampoo for normal hair cleanses the hair respecting the hydrolipidic balance, making the hair clean, soft and glossy. Sanotint Care Shampoo for greasy hair with Golden Millet, Dragon, Witchhazel, Sand Plantain and Camomile cleanses and nourishes the hair, giving it a healthy, glossy look. Sanotint Shampoo for damaged hair with Golden Millet for coloured, damaged hair and/or permed hair regenerates and reinforces the hair, guaranteeing total scalp protection. Sanotint Balm Restructering conditioner is a hair protection conditioner ideal for keeping your hair colour lively and bright between one colouring and another. Migliorin Shampoo Caduta is very effective shampoo against many hair loss problems. The unique formula of this excellent shampoo gently cleanses fine, fragile hair without damaging it.